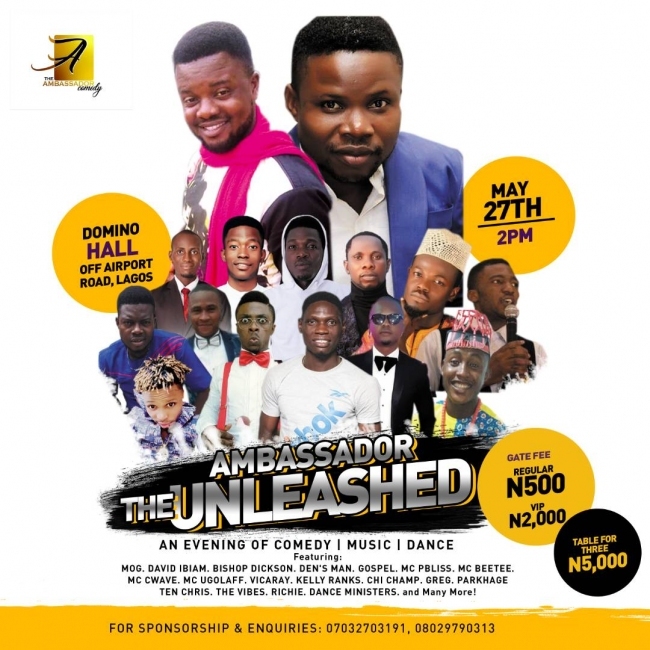 Click to enlarge Ambassador's "The Unleashed" is a live comedy/concert featuring the best of COMEDY, MUSIC, DANCE & DRAMA. The event has been loaded with superstar comedians, musicians and actors like: MOG (Akpors), MC Beetee, The Ambassador, MC David, MC P'Blissz, Bishop Dickson, UgoLaff, MC Cwave, Vicaray, Kelly Ranks, Chi Champ, Greg, Parkhage, Ten Chris, The Vibes, Richie, Dance Ministers, Gospel, Den's Man & Many more. It promises to be a May 27 with a difference!See posters for more details! City: off Airport Road, Mafoluku, Lagos. Bullet Description: Ambassador's "The Unleashed" is a live comedy/concert featuring the best of COMEDY, MUSIC, DANCE & DRAMA, powered by superstar comedians, musicians and actors like.